Description: An ex-CNW AC44CW in Operation Lifesaver paint at Croxton Yard. Description: NS 134 descends the Loops at Andrews Geyser. The tracks make a complete horseshoe curve around the geyser. Description: NS 134 is just underway as it negotiates the crossover at Biltmore. The W-Line, famous for now idle Saluda Hill, is the track on the left. NS 134 is on the S-Line heading to Salisbury. 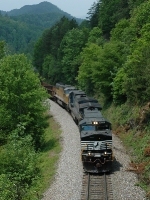 Description: NS 134 approaches MP S120 and Jarrett's Tunnel at Coleman. Description: NS 134 passes the former location of the Dendron passing siding. Description: NS 134 rolls through the S-curve near MP S113 just west of Old Fort. Description: a mixed frieght heads west. Title: NS 9559 near Birmingham Jct. Description: the birds messed up my shot! Description: NS 13G approached through at Reeves rd.